I completed my second race of 2014 with a back to back ITU sprint race. 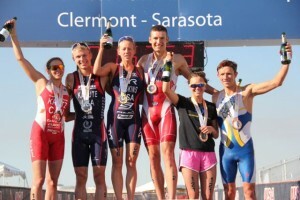 This race was the Pan American Sprint Championships, held in Sarasota, Florida. This was my first time racing in Sarasota and I loved the course! The race took place at Nathan Benderson Park and is the site of the 2017 Rowing World Championships. The race began at 1pm, after the youth and junior races. The weather was cool in the morning, but by the time we raced it was clear skies and 70 degrees! Perfect triathlon racing conditions! I was excited to get out on the race course and work towards accumulating some additional ITU points with a goal of racing in Chicago WTS in June. The swim took place in the rowing basin and was a one lap, 800 meter swim. The swim was a non-wetsuit swim, with water at 20.2 degrees. With the sun being out, it did not feel too cold, especially while racing. The wind was very calm and made for smooth water. I choose a spot on the end of the pontoon and took the swim out very controlled. Half-way through the swim, I was in fourth position and maintained that spot through the end of the swim. I focused on staying calm and ready to exit the swim with a fast transition. Once out on the bike, I saw Sara McLarty and a couple other women about ten seconds down the road. I quickly got my shoes on and attacked up to Sara. Once I reached Sara, there was a small group of four. I pushed the bike hard for several minutes and our group was down to three. We road as a group of three until the halfway point on the bike. Sara and I surged on the bike and the pack was narrowed down to the two of us. My bike is my strength, so I really want to push my strength during the race. 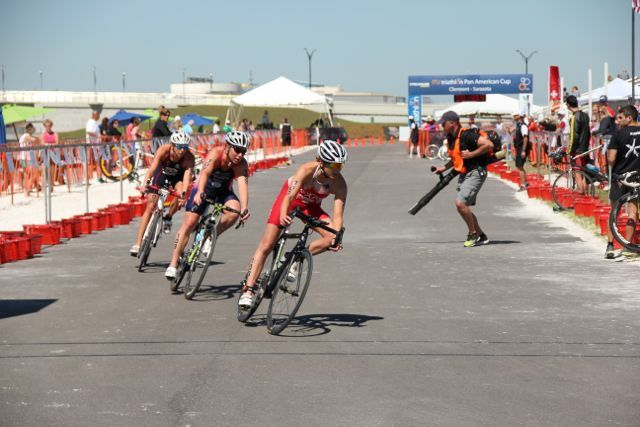 Sara and I used some team tactics out on the bike course, so it was fun to execute out on the race course. Towards the end of the bike, my muscles were feeling the hard attacks I had executed. 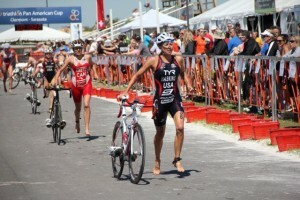 I was curious how my legs would feel running and really settled into a more controlled pace the final lap of the bike. We exited with a 50 second lead. The first part of the run was through bumpy sand and once I got through that 150 meter section, I felt great. I don’t enjoy running on very uneven footing, especially since my ligaments are still a bit loose from nursing, but even though my ankles rolled a little, I was ok! The run was a two loop run through the park with a few small hills. I really enjoyed the hills, as it broke up the run mentally and it flew by. After the first lap, the chase group had put ten seconds into my lead. I figured I needed to keep running hard, but didn’t have to go into that extra gear. The finish was very fast with a downhill that took you straight to the finish line. I was very happy to break the tape and have my second victory for the year. 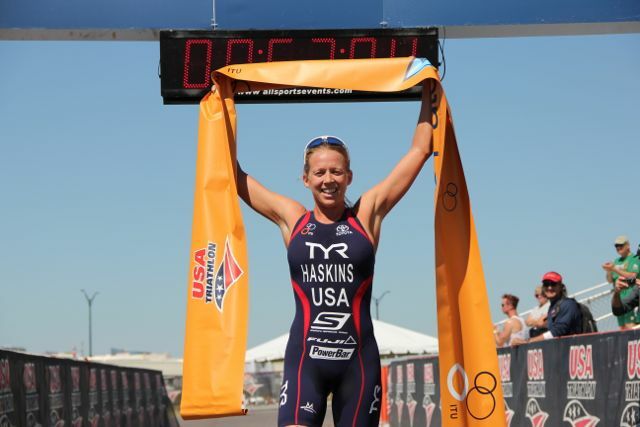 Every win is special and I had a blast with this short, fast style of racing the past two weekends. Next race up is the Lifetime Fitness Nautica South Beach Triathlon. This will be my first Olympic distance race and a very different format from the past two races. I won’t be executing as many attacks on the bike; however, the race will be longer and tough! Miami is usually warm and humid by April, so hydration will by key. I look forward to more solid weeks of training in preparation for not only next race, but a set up for the year. Thank you everyone for your support and kind words on my return to racing this 2014 season.